John Hyam looks back at a couple of war-time meetings at Crystal Palace. The sport would never return to the venue once hostilities had ended. Tracy Holmes turns the spotlight on John Goodall the former Sunderland Stars rider. Tickets are now on sale for this year's Hackney Speedway reunion. Organiser Paul Tadman brings us up to date with prices and what's on offer. Terry Jones is looking for info on his Grandfather, Billy 'Cracker' Simpson - Can You Help? "Call yourself a Pirates fan and you leave out Geoff Mudge and Pete Smith (my sister would never forgive you!!!). Some great names there but my early years of Pirate worship were dominated by Ross Gilbertson and Bill Andrew. Two great riders whose spectactular riding sent me home each week grinning from ear to ear...."
"Well done Speedway Plus for your article on Sponsor Speedway, this is just the publicity this scheme needs.This scheme is going to be huge so to all your viewers/readers PLEASE HELP BRITISH SPEEDWAY GET BACK ON TOP! !>>>>.Come along to Mildenhall on Sunday13th May and see for yourselves the talent in British Youth Speedway. Mildenhall will be a great meeting the promotion there are fully invoved in bringing on our young riders. Jez and Keith of Sponsor Speedway will be there too, come and have a chat to them. See you there!" "This looks an excellent initiative on Tony Webb's part and deserves all success. A pity buses from where I live (South London - joke) don't pass the library. I would love to be there. 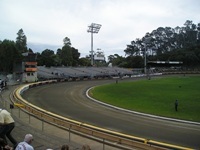 I am sure many Australians interested in speedway locality who live in the area will give their support to the venture." "Happy days at Weymouth indeed. I remember a lot of John's frustrations at the time. John was also godfather to my late son, Ian, and I would love to get in touch with John if possible, and have a reminiss. For the record, I am the lad in a white jumper, helping to put up the posts for the perimiter fence, in the second photo." "Ohhhhh, Hyde Road. Only saw 3 seasons of speedway here but I remember every detail like it was yesterday. I know the old place could have never survived with those wonderful old wooden stands but wish someone at the time had the money to buy the place and let us have a couple of more seasons with the old stands and (when only absolutely necessary) developed the place and kept the track intact." "Nice shout, Ivan. 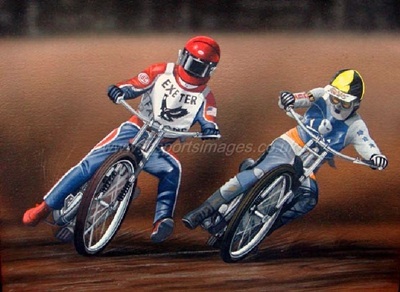 Football i s more accessible to the vast majority of the population than speedway racing is. It's played in schools across the country and tends to monopolise the media. Other sports have marketed themselves much more professionally over the past two decades and I still say the biggest problem speedway has is internally. It will never have any credibility as long as those in charge remain in control of ALL the decision-making. It needs updating with fresh ideas. Individual clubs sometimes come up with some great ideas but they are few and far between now. There are also so many other things for people to spend their disposable incomes on these days. In one year I counted I had been to 20 rained-off meetings which included many days holidays taken from work. As a Middlesbrough fan having meetings at Eastbourne, Exeter, Milton Keynes, Poole and Wimbledon rained-off was no fun as it was virtually impossible to travel for the rearranged matches because of work commitments and the expense. The average speedway attender wouldn't tolerate that amount of postponements and look for other more value for money things to spend on. I know of someone who promoted speedway at Oxford a few years ago now and he said it didn't matter how much he tried to promote the sport at Cowley, the crowds never increased beyond a certain level. I only went to Newport once in 2009 against Scunthorpe in a Conference League match - which turned out to be a cracker. There looked like there was around 300 there the day before the Grand Prix in Cardiff but crowd levels last year were very rarely if at all above that figure - and that was for PL speedway. It's a real shame that a purpose-built stadium has gone out of business. Tracks that have had long absences from the sport such as Plymouth, Redcar & Scunthorpe have proven it can work but its certainly not easy to keep the momentum going against a backdrop of a recession." Globetrotting Charles McKay was at the recent Grand Prix in New Zealand and captured these pictures on practice day and at the meeting itself. Adrian has followed the Wildcats at both Poole and Weymouth. Here's his selection of his favourite riders down the years, most of whom have turned out for Poole at some time. 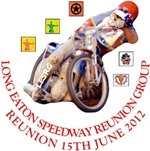 Details of the annual reunion of Long Eaton Invaders riders and supporters. This year's event takes place in June. 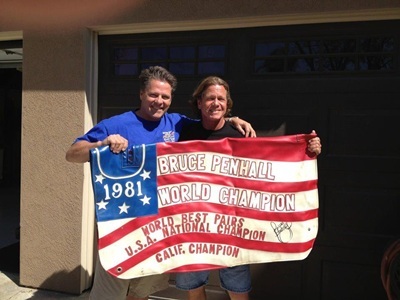 Bruce Penhall recently donated his bike cover to the Denny Becker cancer fund. Here's Bruce with old pal Bobby Schwartz and the prized item. Jeana Werntz is looking for info and pictures of Canadian rider from the 1930's Jmmy Gibb. Jeana is a relative of Jimmy's and tells us he's still alive at well at 101 years of age - Can You Help? Cyril Cooper wonders whether an Australian cricket team ever played at the Tamworth speedway stadium - Can You Help? Jim Henry is looking for results from second halves at Middlesbrough in 1963. Email Jim at jamesjhenry@yahoo.co.uk if you can assist. "I am the youngest sister of Ken, my beloved brother who was not only a great, if not the greatest speedway rider, that came out of Scotland. He passed away much too soon and I miss him every day of my life. He was a fantastic brother, very loving and very caring and I miss him every day. I loved him so very much. Thank you to everyone who wrote about Ken. Very touching." "I just stumbled across your article here on the great Norman Hunter, what fabulous reading, I hope there are more stories from you like these. I went to Coatbridge (Albion Rovers Ground) many times in the late 60s & 70s. Many of the top riders then came from Sweden. I have some original newspaper cuttings in good condition, showing photographs of Reg Luckhurst and Norman Hunter in a challenge match - Bees against West Ham, dated 1964. Also a world team cup shot with Mac speeding into the turn ahead of Soren Sjosten taken by Alf Weedon. Brings back great memories." "Please excuse any inaccuracies in my recollection as I was only a young kid at the time. Now I'm a silly old fool. I was a keen Poole Pirates fan and my hero was Ross Gilbertson followed closely by Bill Andrew. I am sure (here we go!) that Bruce was introduced to British Speedway by Bill in 1965. My memory of Bruce was that in his first few outings he just went flat out usually ending up in the fence before completing a lap. The sages in the crowd put this down to the larger tracks down under and each week we willed this exciting young man to hang on for four laps. Each circuit he got faster and faster and nearer and nearer to the fence.... Every time he went down the crowd went silent - until he eventually got up with a big grin and a cheery wave - sending the crowd wild with cheers of relief... Over the next five years as I grew up I watched this young nutter grow into our hearts and become a cracking rider - then he went and (gasp) joined our arch rivals Exeter bl**dy Falcons! Great memories probably tinged by gross innacuracy.... "
"I have met and worked in the pits with Bruce back in the 80's when he rode for Wolves. He was a true profesional always looking after the younger riders regarding set up and a like. I still see him around Wolves from time to time, he hasn't changed much. Great rider and guy to have on your side, speedway misses the riders of the seventys and eighties - what a great time to watch speedway." "Wishing you guys all the very best.This is an excellent idea to raise not only awareness for the sport, but to help these young lads. Lets hope the British lads can really make an impact to bring the sport in England, back to the numbers it once was. Good luck." Details of a new scheme intended to raise funds to support young British riders and the clubs that offer opportunities to youngsters. It's a simple idea that will hopefully generate much needed funds to help kids make their way in the sport. 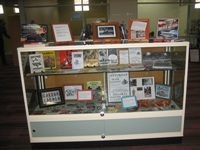 Tony Webb on an upcoming speedway display at a library in Brisbane and invites speedway historians to meet up with him to discuss old times. "I agree with your correspondent that there should be speedway at Odsal. I only went there twice, for the World Finals. I have to say the terraces frightened me a bit, steep and very large. Having said that, I recently went to the Millennium Stadium in Cardiff (on the tour), and I thought the terraces were even steeper, and there seemd to be nothing to prevent a large guy falling over and rolling over dozens of people below. I thought Odsal a good track, and not too bad to get to. Lets hope, one day." "I remember very well the first practice at the track. Charlie Monk was the first man on the track and promptly fell off at the first bend as the track was so slick. I am happy to say I still have my first cheque from there for a second half ride which I did not finish, the is made out for seven shillings and sixpence (37.5p) which was the starting money, ten shillings less 2 shillings and sixpence for fuel. Happy days." "Thought this piece was true and straight to the point ...Ivor was without doubt one of the finest riders to race around Dudley Wood and was a match for any rider in the Provincial league....him and Harry Bastable were a good combination .....Remember as a lad his immaculate JAP machines ....great days...Can still smell "the Castrol R" as well as the dope..Happily came home filthy from watching the racing.."
"Ian Beattie, are you the same person that was involved when there was a training track at the Gyle one winter? Which I remember for a very young Bobby Beaton crashing and old Jimmy giving him hell if he had damaged the bike." "Commendations to the authors of this Belle-Vue tribute site, I can recall great days as a youngster attending Belle-Vue speedway & the gardens, now pushing 60 I am still going, however those early days were quite literally the Golden years. Keep the Legend alive, that is Belle-Vue! " "AS a young boy I used to attend the Dudley Wood track. In those days there was no such thing as tear off and speedway riders used to put cheap plastic goggles over each other to clear the dirt. At the end of meetings riders gave their goggles away to fans . I remember waiting in line behind his van for my chance to get a pair. For many years I had a pair of Ivor Brown goggles along with his picture and a green club badge on my bedroom wall . I remember Ivor's white smock . He became most disgruntled if there was any dirt on the front of it. He didn't like coming second." "This is a very interesting article by Tracy Holmes, but I wonder if it truly represents the moral victors. Thanks to a 'quirk' of the GP system, the winner of the round is not necessarily the one who leaves with the most points. Take that into account, then Andreas Jonsson would indeed be a triple winner. But the really unlucky rider in that respect must be Fredrik Lindgren. Twice he has top scored, but that gold medal continues to elude him. On the other side of the coin, perhaps one of the most fortunate riders on the night must be Rune Holta. He took advantage of Freddie's first missed opportunity and walked away top dog despite scoring five points fewer." "Re Bob Rowe and the Track Record. Now it could be mis-print in the programme, but R.J.Rowe shows as the SCB Timekeeper for nearly all the season, except that first match on the 7th April 1969, when Ray set the Track Record, we had an ACU Timkeeper G.F.Little. Does anybdoy know the differance between an ACU and a SCB time Keeper?" "More fantastic memories from Mr Colvin. As a 'pusher' at White City in 1968 (no! not a drug dealer - I just helped the Y/B helmet rider on his way - honest m'lud! ), I was paid to mix with my heroes of the track. The two guys leaning against the fence in the 1950 photo were probably in transit between pubs and were unsure if it was New Year or New York. " Another instalment from Peter Colvin's popular series of vintage photographs. This selection includes this great colour shot from a Glasgow v Swindon meeting in the sixties. More pictures of Ice speedways - courtesy of Zdenek Flajshanz. This time the tracks are in Germany and the Czech Republic. Roger Abel is the latest to undergo a friendly interrogation from Tracy Holmes. Roger is another former rider that still takes an interest in the sport. Condolences to the Penhall family on the loss of young Connor this week. Bruce's son was killed while working on a road crew after being hit by car. Thanks to Ivan Blacka and Richard Austin for letting us know about this tragedy. There's a video on Youtube that shows Connor in Moto-X action a few years ago. 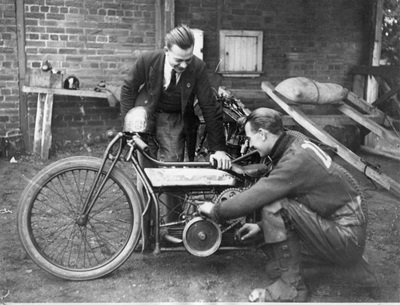 "Roy Uden did ride speedway pre-war at Rye House and also rode in a few meetings there during the war years. After the war he had a 1947 trial in Division Three with Plymouth, but did most of his league speedway for Rayleigh in the late 1940s. Roy was late a leading stock car driver in the latter part of the 1950s, possibly into the early 1960s. He also owned a car showroom/petrol station just outside Rayleigh Stadium. In later life, Roy went to live in Spain. He passed away a few years ago "
"Ian Hoskins promoted speedway in Majorca, I think, using Bultaco engines on machines built by Reg Luckhurst. " "I have followed the exchanges about the West Ham track record with interest. Pleased to say that i was present at virtually every home meeting between '65 and '70 and was the ACU timekeeper for much of that time and although I haven't got the programme to prove it, am pretty sure I was on duty when Ray Wilson broke the record. The one-lap times of Ken McKinlay and Sverre Harrfeldt which I was also on duty for were rolling starts. Good old Dave Lanning was responsible for introducing that interval attraction each week and i would leave the timekeeper's box and go out to the starting gate, with Dave on the mike and do the timing from there ! As I've mentioned on Speedway Plus before i've worked at a lot of dog tracks which also featured speedway -Knowle(Bristol),Oxford,Leicester,White City, Wembley,Wimbledon, Belle Vue (Kirky Lane) but undoubtedly the best and that which provided the happiest memories for me was West Ham. " "You only create work like this if you love the sport. Very generous of Maureen to present them to the riders." "Thank you for publishing my story on my tapestries. Thanks to Ivan Blacka in the first place, for pushing me to do the story about them, without him it would never have come about. Blown away with the comments from Graham Frost & Mick Hargraves & David Walsh for their comments.Thanks guys, it made me cry, you made me feel very proud. But thanks to every one who took the time to comment. I enjoyed making them & best of all giving them as gifts to the said riders who deserved to own them." 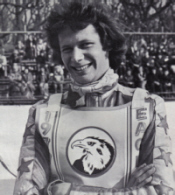 "I live in Switzerland nowadays and watching Sky Sports, I thought that I would look up one of my childhood heroes, whilst living in Leicester and watching the 'Friday night Speedway'. So sorry to hear of Ken's passing. My own memory is of his full points most weeks and especially the thrill of when he lined up in the outside position. He was so fast at the gate that he just went straight to the corner, from the outside position, and hit the front on the first bend. A thrill to watch. Great days! Graham Fox Once of Mowmacre Hill, Leicester." "Chris Bailey,Top Bombing!!! Always wondered where he went too. Watched him race for Barrow Bombers at Holker Street,very stylish,very very well turned out bikes & brave as they come!! Tipping into that first turn on a summers evening, with the setting sun making it a blind 'Pin it & Pray' job, took a lot of nerve. Glad to see the passion for two wheels has not faded, look after that Matchy." Former Cradley Heath rider Bob Andrews popped down to the GP track at Western Springs in the build up to this weekend's opening round. Eventual winner Greg Hancock and track guru Ole Olsen were amongst those he encountered. Perhaps surprisingly, Greg Hancock has just won back-to-back Grand Prix rounds for the first time in his career, Tracy Holmes looks at the record books to see the others that have achieved this feat. "Ssssshhhh Ivan! I'm just going to borrow them! Seriously though I wish I could have gone to that shin dig!" "Hackney Olympic reunion. Paul Tadenham mentions the 'unique atmosphere' at Waterden Road. In the late 1960's I used to visit Hackney very few weeks. I was a West Ham supporter, so had a few mixed feelings. I totally agree that the place had a unique atmosphere, I thoink it was the smell of paint, or some chemical that pervaded the air!!!! Having said that the track was great, the racing was great and Uncle Len was (and happliy is) a great promoter. Lets hope that visitors to the Olympics get to smell the paint too." "I was there for both meetings as a 12 year old. I bought an Ashington Arrows badge, then took it to school and the teacher took it off me, 41 years ago. I have just got the same badge from ebay, wow am I pleased!" "As a little boy I sent a get well card to Sverre Harrfeldt whilst he was in hospital following his dreadful accident. I was pleased to receive a card in return from him thanking me. Proving what a lovely man he is, a few months later straight out of the blue I received a Christmas card from him. I still have both of them!" "I was at two of these meetings as a wide-eyed 11 yer old, including the World Champs prelim won by Russ Dent. We were all big Monarchs fans, and I remember the riders willingness to sign autographs without having to queue by the pits for ages! Sadly the programmes are long gone, but I still have one of the few FiFe Lions metal badges. " "Actually lived in Hornshay st until i was 19, when I joined the army.Went to the speedway nearly every week,and stock car racing, dog track, when we could bunk in. C,mon you rangers! Johnny Hoskins was the king of the game. Saw some great riders - Ove Fundin, Barry Briggs and many more. Great times." "Odsal in Bradford should have speedway bikes again as I spent many hours there as a youngster with my dad and thousands of other people." "There was no restriction by the Spanish authorities in regard to what sort of bikes were used. There have been several ventures to try and establish speedway there over the years. The basic fact is that for some reason speedway does not appeal to Spanish sporting tastes. So far as the Almeria venture was concerned the problems lay over planning permission, then that the track was built across to local authority borders. 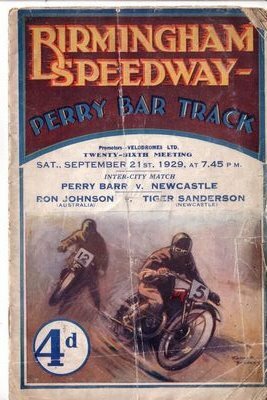 Speedway is Spain - the late 1920s and early 1930s. Then 1948, 1950, 1953 and the early 1980s whne Wally Mawdsleyy was involved in a track in Madrid. Wally was not involved in the early 1970s effort in Majorca - it was Ian Hoskins and Reg Luckhurst. They used 250cc bikes because they were quickly built to speedway design by a local motorcycle dealer at a reasonable cost for mainly novice Spanish riders rather than burden them with having to buy more expensive conventional speedway machines." "I started following speedway back in 1971 as a Rayleigh Rockets supporter and well remember Roy's motor business by the Weir. Only later did I learn of his history with the Rockets. In the mid eighties I was in Estepona on the Costa Del Sol covering a pro-celebrity bowls tournament of all things for Screen Sport when I was introduced to an elderly spectator who I was told also had speedway connections. I was delighted to find myself being introduced to Roy!" "What a coincidence. I just got a puppy a minature schauzer all black. Guess what her name is. (Bianca Blacka) "
"So far as I know the rider in question was Jimmy Cox, not Keith. He had rather exotic leathers that earned him the nickname of the "buckskin boy" "